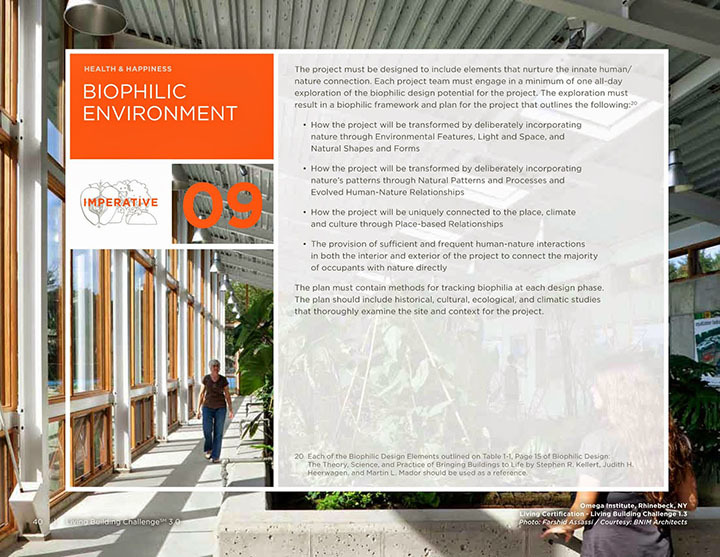 The design team is embracing the principals of Biophilia to help guide the design decision making as well as work towards compliance with the Living Building Challenge Imperative 09: Biophilic Environment. As defined by ILFI, biophilia is “the innate, genetically determined affiliation of human beings to nature and other living organisms”. Manifestations of this could take many different forms, from biomimicry, to sensory variability, to using organic shapes. These and other strategies are categorized under environmental features, natural shapes and forms, natural patterns and processes, light and space, place-based relationships, and evolved human-nature relationships. The kickoff to this design thinking for the Nuthatch Hollow project was the Regenerative Development Workshop, facilitated in October of 2016. The workshop brought together the design team, Binghamton University students and faculty, and the wider community, on site, to immerse themselves in the essence of Nuthatch Hollow. After exploring the nature preserve, learning more about its history, and connecting with others, the workshop group produced a list of words that spoke to them about what the spirit and essence of Nuthatch Hollow are and the elements that make it so unique. The awe of nature, and human’s affinity for it, are most definitely invigorated in this beautiful place. The goal to incorporate the natural elements of Nuthatch Hollow within the building is unanimous and the list of words have been a constant driver through the design process. Locating the building along the seam of a hill so that visitors approach the building from above, descending to the entrance, cultivating curiosity and inviting exploration, acting as a gateway into the sanctuary. Orienting the building to not only for solar considerations but for optimal views of the pond to the South, bench to the North, and clearing to the West. Using wood species and stone types local to the area and found within the nature preserve to provide a strong contextual relationship between the building and its surroundings. Designing the interior in a simple manner with framed views to the outside to provide a neutral background for the beauty beyond. Purposeful placement of windows to provide dynamic multi-direction daylighting within the building, providing an effect more similar to being outside. Coordinating ceiling elements with window placement to create shadows mimicking sunlight filtering through the trees in the forest outside. As the detailing of the design and the material vetting continue, these strategies and the principles of Biophilia make the design even more grounded in place, aligned with the spirit of Nuthatch, and true to the goals of the project.